The new icon, designed by seventh, has been selected. 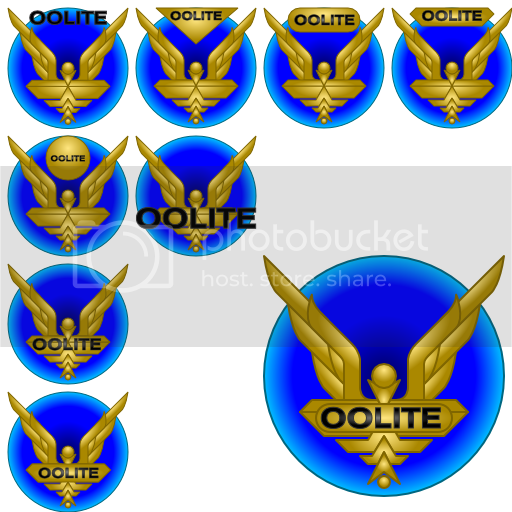 Oolite requires a new icon. Current systems use icons up to 512 × 512 pixels, while the current Oolite icon only exists as a bitmap up to 128 × 128 256 × 256 pixels, and doesn’t really have enough detail to be enlarged anyway. For these reasons, I am soliciting designs from the comoonity. Entries must be submitted before Oolite is ready for a “stable” release, which won’t be for at least two months. One entry will be chosen, and the designer will win nothing other than having their design as the official Oolite icon and a mention in the official Oolite credits file. One 512 × 512 pixel icon with alpha channel, designed to composite against arbitrary backgrounds and be recognisable at resolutions down to 16 × 16 px. Hand-tuned icons at sizes: 256 × 256, 128 × 128, 64 × 64, 48 × 48, 32 × 32, 16 × 16. A monochrome version of the icon. A vector version of the icon. A larger version of the icon (1024 × 1024 or above). Any original files used to create the icon. I will create appropriate document and OXP icons for each platform based on the application icon. All submissions must be licensed to the Oolite project for distribution under Oolite’s dual license and any future license Oolite may switch to. Last edited by JensAyton on Fri Mar 05, 2010 4:57 pm, edited 2 times in total. Note: KZ9999 is already working on a submission, but some healthy competition would be nice. There is no requirement that submissions look like the old icon, although a starbird-type design is an easy way to score on sentimentality. :-) I’d be happy to see a more “realistic” take on the starbird if anyone’s up to it. Location: Lost in Witchspace being hunted by a Thargoid Swam. I second the request for competition. I would love to see other peoples takes on a figurehead/logo for the game. 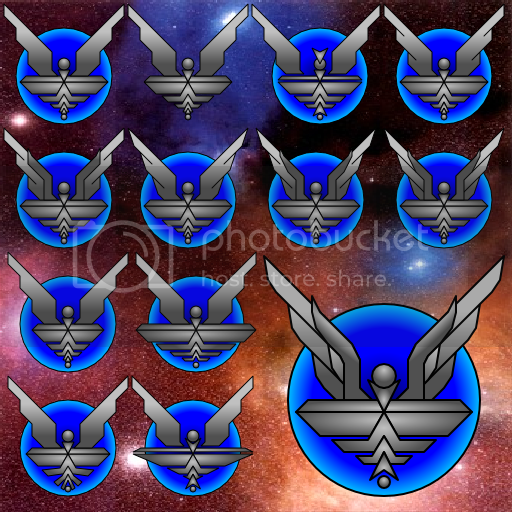 I just started doing the classic starbird because of my own need for a vector version of the logo. There's no reason why the oolite logo should even be the starbird. The way game is expanding in so many new directions, it's only logical that we have a new take on the logo too. Plus any new takes would inspire me to come up with other funky ideas for it. I know I've gone overboard with the highlighting filters and it won't scale down that well but just an idea to get you other talented artists going. the blue disc behind the starbird represents a witchspace cloud and it's a full alpha channel object so it's quite transparent. So come on folks, I can't be the only one with the talent to come up with the goods. This is my first official submission for the Logo Redesign Contest. Image examples in order from left to right, top to down. Gray Scale, White body with black border. Filters applied: Simple spectacular effect, Glowing metal effect, Translucent glass, Matt button effect. 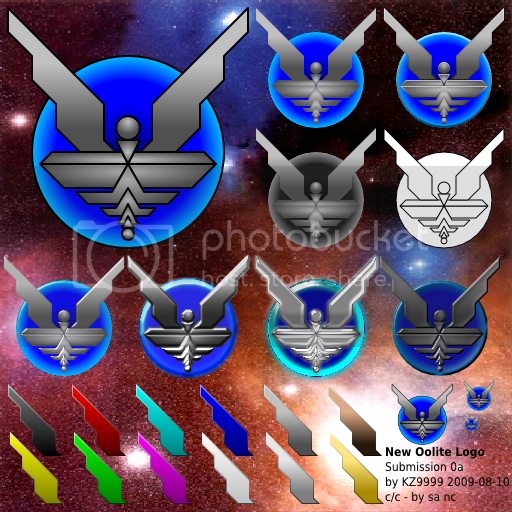 Alternative Tints for Starbird: Black, Red, Cyan, Blue, Steel, Bronze, Yellow, Green, Magenta, White, Silver, Gold. The images have been placed on a multi-coloured background to show the effectiveness of the design and to highlight where alpha channel effects have been used. No text is included with the logo, the reasons being that: 1 ) If text is to be used it must be the central part of the design, i.e. IBM or SUN. 2 ) If text is of lesser importance, it should totally abandoned to avoid repetition of the `name', i.e. Pepsi or Subaru. 3 ) Finally is is pointless to include text in the logo for it will blur as it scales down, effecting the surrounding graphics. It's simple and clean and I think it would be nice as a badge or embroidered patch that could be worn on (in-game) flight suits or civvy clothes as well as a game logo. Much tweaking could follow, but this is the basic idea. There is also a version with a circlet around it holding a lozenge above the robotic avian's head which could be used for actual military rank or some other supplemental information. It's a fortnight later and here's another batch of designs for the comp'. All of these designs take my standard design and twisted it in to different directions. b11 twisted blade body, b12 wide gappy body with collared head. Large image: Full feathered wings and tail and collared head. It should be noted that I can mix and match features from the various designs to make a better design. That looks very good KZ9999. 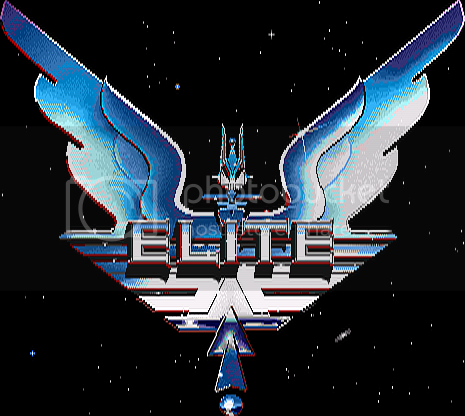 I just realised that a spaceship based off of the Elite logo would be many kinds of awesome itself. Anyone care to give that a try? No need to name each version as they all are pretty self explanatory. The only thing I will add is that is that all of the three official sets I've posted can be mixed and match to make the final design. That's it, I'm out of ideas now. Come on folks, give it your best shot and post something. I don't think that EVERY graphic element needs a gradient fill. 'Course it does! Too much still ain't enough! Concerning the new Oolite icon, there appears to be a concensus of silence. (Apart from general approval of KZ's work). Why not get away from the starbird design completely. As I see it, that style is a bit passe. A “standard” outbound Cobra against a wormhole background (no frills or extras) as in KZ’s early t-shirt design seems to me to be a far better choice. However, that’s only my view, of course. I'm sure many will disagree with me on that. One of Griff’s Cobras would also look very good, but maybe not at small sizes. I sometimes wish I had the art skills for this sort of thing, but I most definitely do not. Ahruman sort of suggested he’d like to see a more “realistic” take on the starbird, but I cannot envisage that at all. El Viejo wrote: Ahruman sort of suggested he’d like to see a more “realistic” take on the starbird, but I cannot envisage that at all. “Less abstract” might be a better description. After all, the original Elite logo is less abstract than the current Oolite icon or KZ’s proposal.